Vest sets have an urban inspired fashion that is unique in the world of mens clothing and clean up nicely with the latest Stacy Adams Shoes and a crisp looking Homburg Hat if you're so inclined. 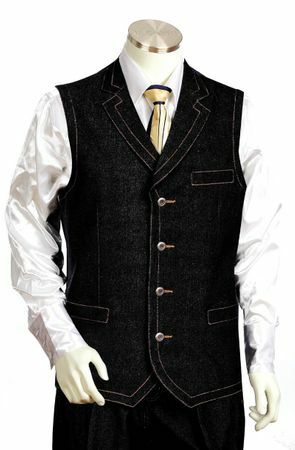 You'll will find only the most stylish dressed men wearing these vest outfits when they go out at night ready to really have a good time with friends at the club. The ease in which you can portray yourself as having your act together when it comes to style is quite easy when you consider wearing 2 piece vest outfits. All you need to do is just decide on what type of dress shirt to wear underneath and what sort of dress shoes to go with it and you're done. You'll find that we have a great assortment of denim vest outfits made by the leader in mens high fashion clothing Il Canto. Il Canto specializes in providing these urban inspired vest sets with an attention on visual appeal all made out of denim in the latest looks.